Hey, Beauties! I had the pleasure of trying MIRACOS Ion Premium Cosmetic Brush Set and am so happy to share my review with you. 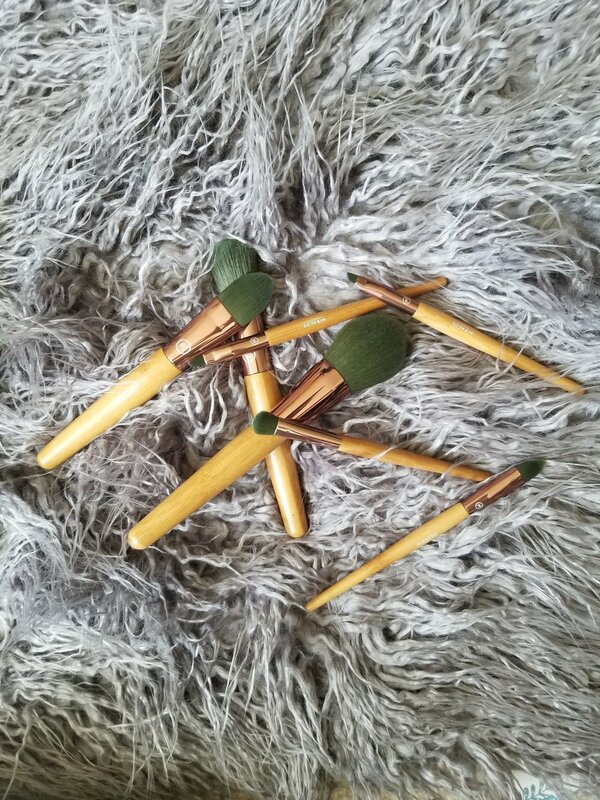 Not only will I be introducing you to the brand but I am going to be giving away a set of these beautiful bamboo makeup brushes. About MIRACOS Ion Premium Cosmetic Brush Set: MIRACOS Ion Cosmetic Brushes is using cutting-edge bristle technology, where the bristle can release ions to reduce skin oxidization, improve cleanliness and provide an anti-bacterial barrier for a more derma-friendly skin. All brushes went through a professional rinse with nontoxic chemicals, ideal for those with normal to sensitive skin. The makeup brush set comes with Oval Powder Brush, a Round Blush Brush, a Point Concealer Brush, an Eye Sweep Brush, a Lip Brush, and Angled Eyeliner & Brow Brush and a Travel Case. The MIRACOS Ion Premium Cosmetic Brush Set is both stylish and functional. A beautiful travel bag for makeup brushes is a must-have because I end up losing brushes from my makeup brush sets without them. 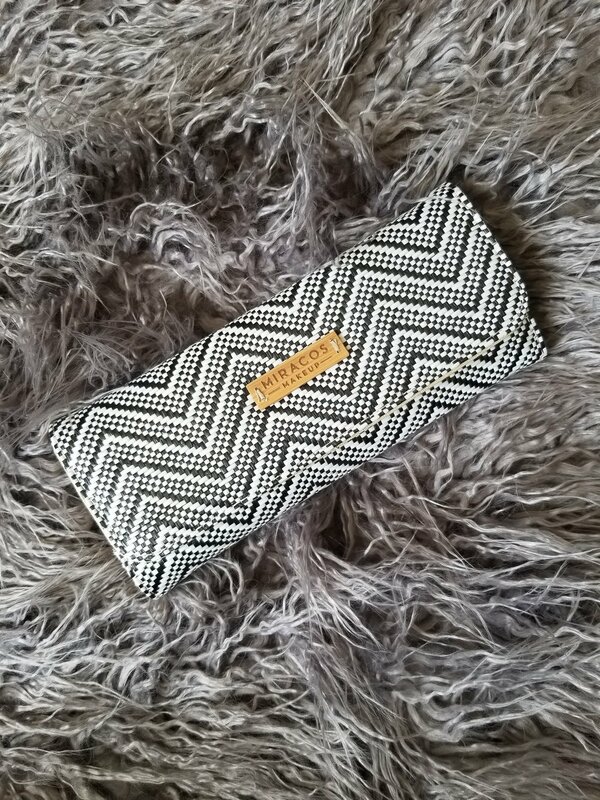 I really LOVE the black and white zig zag pattern. It looks like a chic clutch that you can use as a style accessory, so it’s a really nice bonus. 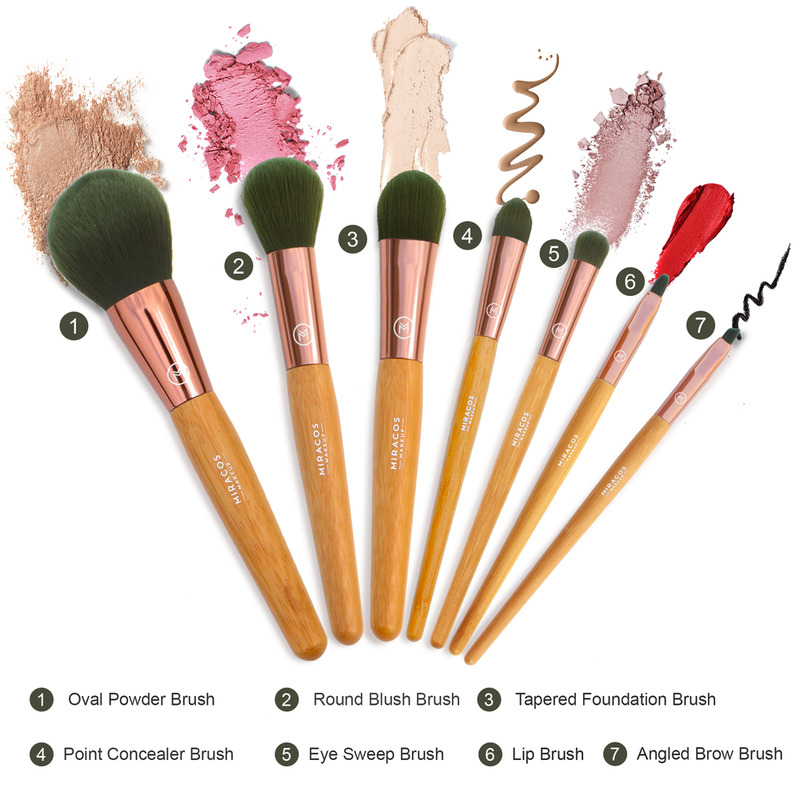 My first impression of the six makeup brushes is that they are attractive and super-soft! They’re made of superior synthetic materials and they don’t shed. Because of the special bristle technology used, they are less prone to bacteria build-up. This is important because my skin is sensitive. I must really watch the kind of bristles I use on my face as I can break out very easily. The handles are made of durable bamboo with a beautiful on-trend rose-gold accent. My favorite brushes in the MIRACOS Ion Premium Cosmetic Brush Set are the Round Blush Brush and the Point Concealer Brush. The shape of this blush brush helps me apply my blush seamlessly! I also use it with my favorite highlighters for extra-perfect shimmer on my cheekbones. The Point Concealer brush allows me to be perfectly precise with my concealer around my eyes where I use it the most. It allows me to place my concealer strategically so that the it doesn’t crease. So important! What I love most about this makeup brush set is that It’s budget friendly. However, the MIRACOS Ion Premium Cosmetic Brush Set is not your average affordable makeup brush set; it’s actually very high quality. This makeup brush set will make a great gift for Mother’s Day, birthday or holiday gift. I will be stocking up for sure! Enter to win a MIRACOS Ion Premium Cosmetic Brush Set using the Rafflecopter Widget below. You MUST complete all entries to be eligible to win. Good luck! 1 winner will receive a MIRACOS Ion Premium Cosmetic Brush Set. Posh Beauty Blog will only ship to U.S. to residents 18 and over. No purchase necessary. The odds of winning depend on the number of entries. Winners will be selected at random using a random selection tool. All decisions are final. All entries received after the giveaway closing date and time will not be considered. Entries that do not follow all of the entry requirements will not be considered. Posh Beauty Blog or PoshBeautyBlog.com are not liable for late or misdirected entries, entry errors, or transmission problems. We reserve the right to terminate the giveaway in the event of technical problems, or to correct typographical or technical errors, or to amend these rules. By entering, participants agree to release and hold harmless the website owners and their respective parents, subsidiaries, affiliates, directors, officers, employees, and agents from any and all liability or any injuries, loss, or damage of any kind arising from or in connection with a giveaway. Non-winning entries from one giveaway are not carried forward to future giveaways. Prizes are not redeemable for cash. Winners will be notified on April 20, 2018 by 12:00pm PST and will have 48 hours to reply and accept the prize(s). Should they not reply, a new winner will be notified. The giveaway is open to US residents only and the winner must live in one of the 50 United States. Shop: Miracosmakeup.com and use code POSH25 for 25% off your order!